Casella insight data management software provides Health and Safety professionals with a more advanced solution for downloading, managing and reporting exposure data for a variety of occupational hazards. Rather than using several software applications to download from many instruments, Casella insight allows data to be downloaded and stored into one versatile package. This means that only one application has to be learnt! Data is stored on a centralised database which may be managed by Person, Place or Process criteria. Data can be viewed in tabular or graphical format and analysed as necessary. Uniquely, reports can be generated combining multiple hazards simultaneously. They may be displayed by Person, Place etc as required. 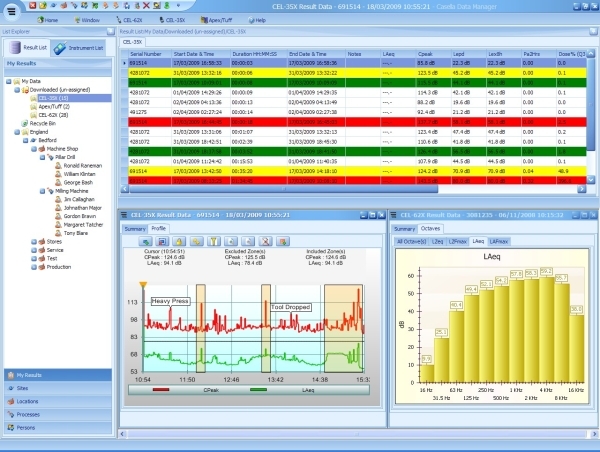 When an instrument is connected to Casella insight, it will automatically download stored data. Instruments can also be configured and controlled. If a new instrument is purchased, Casella insight can be remotely upgraded to activate the relevant 'plug-in'. With occupational monitoring equipment, legislation requires periodic calibration to be performed. 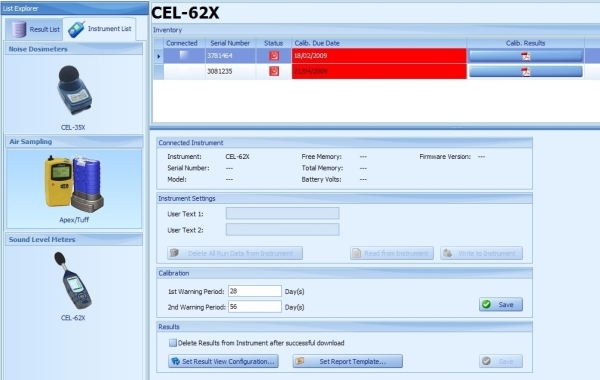 Casella insight will manage all your calibration dates and notify you when they are due, as well as storing calibration certificates. Users of existing Casella software packages can import previously downloaded data. Likewise, data within Casella insight can easily be exported and sent to other colleagues or users, allowing data to easily be shared across organisations. Exposure levels can be colour coded by a simple 'traffic light' system, it is easy to see which individuals or locations are exceeding action levels. Predefined action levels are provided for local legislation or can be defined as necessary. For instruments that have stored the time history of levels (e.g. Noise Dosimeters), the stored profile can be analysed and graphs zoomed in to look at specific times. Graphs can be coloured as required, and notes inserted to illustrate important events. Graphs can be further anaylsed by adding zones (shown right) which subsequently provides exposure levels inside and outside these zones. This allows the exclusion of extraneous events, breaks etc to provide comparative exposure calculations. Any exclusion zones added to data are retained with the data file. A simple 'tree view' can be created with which to store and manage data by person, place or process. Once data is downloaded, files can be dragged and dropped to the relevant tree location and all data is stored within a central database. Templates are provided to view data for local legislation (e.g.OSHA) or can be customised, displayed and reported simply or comprehensively as required. Exposure data from multiple hazards such as noise and dust can be viewed and reported simultaneously. Reports can be stored in multiple formats (e.g .pdf, .jpg, or .csv) allowing them to be shared and viewed easily, as well as exported to other applications. To create a report, simply 'right click' on the appropriate part of the tree view and the report wizard allows creation of a report for people, processes etc from that part of the tree. The integral report wizard allows reported parameters to be selected as required and report settings are retained for the next time it is used. Notes can be added to data, which appear on reports as required. This information could include details about the measurement and subsequent recommendations or actions required to reduce exposure.